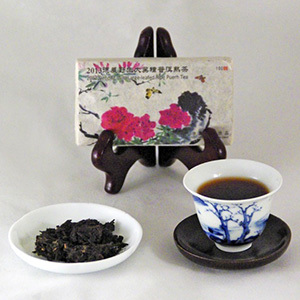 If you are a fan of the Denong Wild Ripe Pu-erh, you will be delighted with this 2013 edition. Combining the 2009, 2010 and 2013 Denong Wild dry leaves, this tea is amazingly rich, complex and smooth. Full-bodied, it offers a syrupy finish in the throat. Like the Denong Wild Ripe Pu-erh of previous years, this tea is made from ancient arbor trees planted in the forest centuries ago in the mountainous areas of Yunnan. It is natural and chemical free. Given the fact that these tea trees have thrived with other nearby forest plants and the roots of these plants have intertwined. The result is a wild tea with unique and complex flavors. Use 5 grams of leaves per 6 ounces of water. Briefly rinse the leaves and follow the brewing times below. Such a deep, rich, complex delicious tea. This is a favorite! Our responseGlad you like it. Thank you for telling us about it.